The walls are thin between the two apartments on the 2006 hit Israeli drama series, A Touch Away. The clatter, conversation and lives of two families –one ultra-Orthodox, the other Russian immigrant- seeping from one apartment to the other tantalized viewers with access into usually unseen worlds. And the daring, star-crossed love that blooms in an apartment complex in the ultra-Orthodox Bnei Brak neighborhood between beautiful 17 year old Roha'le, daughter of the religious family, and secular Zorik, who served in the Army, but now works as a window washer, proved electric for the show's ratings. The eight episode series was the most watched program in Israeli television history and won seven Ophir Awards, the Israeli equivalent of the Oscars and Emmys. It also piqued the interest of Hollywood producers…. 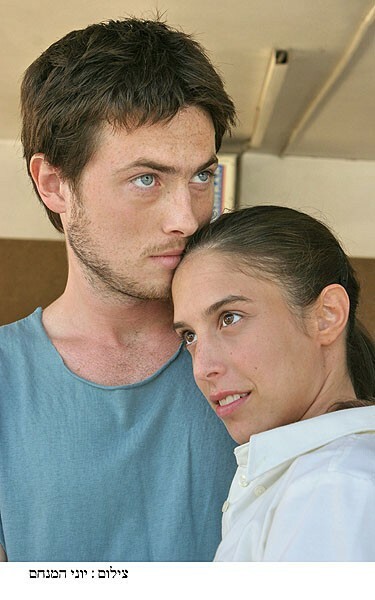 A Touch Away on DVD: This Israeli TV miniseries directed by Zafrir Kochanovsky has recently made its U.S. debut at the 2008 Santa Barbara Jewish Film Festival. Set in the neighborhood of Bnei Barak in Tel Aviv, an ultra Orthodox family deeply ingrained in the most ancient traditions of Judaism has their world shaken when a secular Jewish family from Russia moves into the apartment next door. Already a tenuous coexistence, sparks being to fly when secular Zorik falls in love with the neighbor’s beautiful daughter, Rochale. (Keep in mind, Rochale has also been promised to another man.) As the drama unfolds, it stays lively and amusing while giving the viewer a deeper understanding of the intense cultural conflict that exists between Jews in modern -day Israel. The relationships that develop between all of the characters set the stage for a series of events that will keep the audience on the edges of their seats. A Touch Away is available on DVD from Ruth Diskin Films (ruthfilms.com). Israeli TV producer Zafrir Kochanovsky has hit it big with his award-winning series "A Touch Away". He is currently filming the show's second season while HBO is remaking the first one for American audiences.After more than eighty documentaries, Kochanovsky was asked to do a show on the multi-ethnic society that is Israel today. What he came up with was a Romeo and Juliette-type story of the love that develops between a young Russian immigrant, and the ultra-Orthodox young beauty next door.There is an enormous amount of authenticity about the work that the viewers can't help but agree with the character Zorik's mother who observes dryly "they could stage The Dybbuk here without any props". Zafrir had a very good feeling about the series even before it aired. "There was such a positive vibe on the set that I knew something special was happening here". A Touch Away got the highest ratings ever for an Israeli TV show, swept away the "Israeli Emmy's" and won the hearts of people of all ages." “…a definite crowd-pleaser that the audience adored so much that they cheered for Zorik, the handsome, Russian hero, to kiss and embrace Rochele, the Orthodox heroine. More than a love story, the film engages the audience in Israel society, especially the conflicts between new secular immigrants and older, more Orthodox communities." "Everyone was thrilled with “A Touch Away.” I took a chance showing the first three episodes as our opening night feature, but the audience was so into it that they were outraged when the house lights went up. Everyone who could attend did attend the final five episodes two days later and the others are begging me to let them have the disks."